Have you ever found yourself googling ‘classy Harry Potter wand display?’ Well then you my friend would have found yourself sorely disappointed. Until now. Not surprisingly anything I found that included any form of wand display was tacky and dopey, as one might imagine it to be. 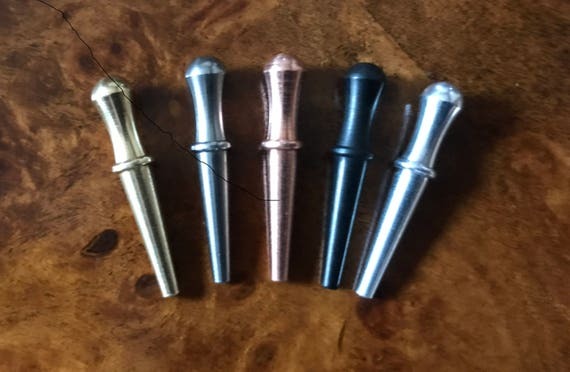 I’m not sure exactly how I came up with the idea, but I found myself toodling around on Etsy for some type simple metal do-hickey that could hold wands. I stumbled across cribbage pegs. I was able to find some that were meant as replacements so we could buy 12 all one color. We went with black to fit in with the other black accents. It was as simple as drilling a pilot hole the size of the narrow end. Then we used a rubber mallet (just kidding the kids broke it like everything else we own. We used a hammer with a piece of cardboard to protect it) to pound it in. Because it is tapered we ended up with a real nice snug fit. The other end of the cribbage peg was basically made for wands with it’s little indent for balancing, with of course the caveat that Harry’s wand is a bit on the bulky side and we ended up using a little double sided tape to help secure. When looking at this set up you might be wondering: Does it make me nervous that we have another soffit that is empty and in such close proximity to the wands? Well of course it does. The last thing you want to do is have any visual cues that could even potentially imply there is room for more wands. Brett, once an avid Ebay scourager, quit cold turkey and it does concern me to tempt him like this. A whole space that seems to be calling out for more wands. Nerve-wracking indeed. So of course beyond the essentials of wand hanging there was also shelves to be hung to hold practical things like drinkware. The whole vibe of the bar was kind of a cool, industrial, light wood tones, masculine with a touch of pretty. We found these pretty sweet iron shelf brackets. They had an industrial matte black look that we were going for. Funny story about putting them up. In the world of home projects putting up a shelf is not up there on the super challenging scale. For reference it is a task my dad would take on. (He’s the one who taught me close enough and is not particularly handy, if you are wondering, yes, of course I take after him in this respect). So of course I wanted the shelves in a spot that didn’t hit all studs. Simple enough. We decided to use drywall anchors. If you are unfamiliar, basically you make an unnervingly large hole and shoved some sort of anchor through. We didn’t use those plastic little ones. We went for the metal-holds-something-like-100-pounds anchors. When you put the actual screw in it, somehow it springs out and anchors behind the drywall. Well for whatever reason that wasn’t shaking out for us. So what did we decide to do? We went around back, sawed a small section out of the drywall behind and then sawed a larger section. And then one person held the metal anchor from the back while the other person screwed the screw in from the bar side. Sweet right? Now to be fair, behind the bar is mostly unfinished space. And we have a storage rack for bins covering the spot. But if you want to get down to it, did we saw through one wall to put shelves in on another? Yes, yes we did. Nothing like keeping yourself in business by always making more projects with each one you finish! We used just simple pine boards for the shelf. Here’s a lesson for those new to any kind of DIY. Common board while cheaper is also much crappier. Spring for the pine, it’s usually less warped and only slightly more expensive. Watch out for anything that says linear foot. The pretty hard woods have a cost per linear foot you buy. How do we know this? We have some lovely expensive little maple book ledges in the kids’ rooms. When we got them cut at Home Depot the guy was trying to help us out and said “you know it’s by the foot right?” Instead of asking any questions we thought to ourselves ‘of course we measure stuff by the foot moron.’ But, like any two people winging it, we played it totally cool at checkout when we found out just how pricey our little boards were. On the shelves we like to store our classy wine glasses and other drink ware. You’ll notice no shot glasses. As a kid Brett collected shot glasses wherever he traveled with his family. Which was among the reasons my mother was once terrified at the prospect of me dating him. A 14 year old dabbling in the slippery slope of shot glass collecting was clearly trouble. Spoiler alert: he turned put to be quite the catch who enjoys a drink in moderation and gifted his once impressive collection of shot glasses to a friend. Since putting the shelves up I can’t exactly say we have really used any of the glassware, because it turns out we aren’t all that classy and mostly drink whatever in whatever it came in. With the except of wine, that might be overkill to drink from the bottle. Stayed tuned to see the whole kit and kaboodle complete! I’ve got two simple projects I need to do before it’s ready for it’s big reveal! But it could be said that I had not fully let Brett bring one of his great loves into the aesthetics of our house. Now I read and thoroughly enjoyed all of the Harry Potter books. I went to many midnight showings of the movies. (None of that had anything to do with thinking a certain 15 year old Brett was a total babe.) But alas my wand collection, signed movie posters and first edition print book collection was non-existent. So all that being said, and loving my hubby the way I do, I agreed to let him do the bar up in all Harry Potter paraphernalia. But, being the wife that I am and being trepidatious that a part of our house would look like crazy town, we tackled it together. This is how our basement looked on move in day 5 years ago. The bar is at the end of our family room on the right side. A few things to notice, yes, we once had a 100 gallon fish tank in the wall. We no longer do, to the chagrin of some. Also the former owners were really into weird industrial sort-of shelf hanging things that couldn’t really support much weight. You can see to the right in hunting orange is the laundry room and utility room which is all unfinished space. Through that little doorway is also our back stairs. The bar was present when we bought the house, complete with a small sink, fridge and built in bar. Funny story about the sink… Before we ever decided to tackle this area of the house we’d occasionally use the sink to wash things or just get some water. We also happened to store all our paper bags from grocery shopping under the sink. Well at some point the long flexible tube that takes the water from the sink and drains right behind the wall into the basement floor drain, had become unhooked. And we didn’t notice. Until one day we opened the cabinet to add some more paper bags, noticed they were soaked and a whole slew of little flies swarmed out. Turns out it had probably been unhooked for a disgustingly long time. The moral of the story is the first thing we ever tackled for this area was painting the inside of the cabinets with Kilz because it seemed appropriate. The other strange thing about this space was the counter tops themselves. They were made out of cheap common board and then “distressed.” The air quotes are because to distress the countertop they hit it with a hammer and also hammered the indent of screws in as well. Here’s a closeup of the handiwork. So apart from just decking it out in Harry Potter themed things, we had a few projects we wanted to tackle. We wanted to lose the yellowy beige wall color and paint the cabinets. You can’t see it in the before pictures, but on the fridge wall there is a slim countertop with cabinets below. All the wood in the basement is stained very dark and we were really looking to freshen it up. The plan: We had already painted the rest of the basement Benjamin Moore Palladian blue, which looks really nice and happy in a not terribly well lit space. We decided on Stratton blue, a slightly darker shade on the same strip for the walls of the bar. The black is just a true black that we got from Sherwin Williams for the cabinets in a matte finish. Brett prefers to say flat black because apparently that’s what all the sweet cars are. I prefer Sherwin Williams for paint because they are usually cheaper and once they gave me a whole paint deck to borrow that I still haven’t returned, so I know all their colors. But I have to admit Benjamin Moore does have some perfect colors. That’s also a little sneak peek of the counter top we landed on for the bar. Prepare to be amazed next time at just how many Harry Potter things made it in and how it surprisingly doesn’t look like a complete joke. Accio classy Harry Potter themed rooms!